Nitrogen, phosphorus and potassium are essential nutrients needed for plant growth. They can be found in many things such as fertilizers, pesticides, animal waste and detergents. However, excess nutrients are a problem. Among these nutrients, phosphorus is the most damage-causing element in area lakes and waterways. Pho sphorus within the water system causes dangerous algae blooms, excessive aquatic growth and a decrease in dissolved oxygen availability for aquatic life. These plants and the water quality problems that occur when they decompose, can kill fish and other organisms. Also, these toxic lake conditions limit human use and enjoyment of the lake. 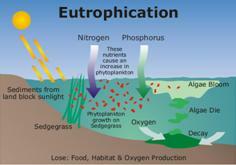 This process is known as eutrophication. Fertilizers high in phosphorus are frequently used in home lawn care. When applied to your lawn, fertilizer can easily spill onto driveways and sidewalks. It can be washed into storm drains and flow over surfaces during a rainstorm or snow melt and settle into waterways and lakes. This excess phosphorus greatly speeds up the eutrophication process, and if not controlled, can cause a lake to 'age' more rapidly. To improve and maintain lake and stream water quality, Allegan , Muskegon, Ottawa, Van Buren counties and others in Michigan have adopted ordinances specifically forbiding the application of phosphorus to established lawns unless a soil test confirms a deficiency. Most soil in our area already carries enough phosphorus to support a healthy lawn. For a small price, homeowners can request a soil test to see if their lawns need additional phosphorus. 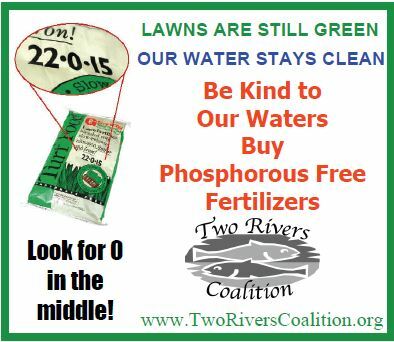 If additional phosphorus isn't needed, homeowners can buy zero phosphorus fertilizer through a local garden, farm, or hardware store or work through a lawn service that provides zero phosphorus fertilizer. Fertilizer bags carry numbers giving the proportion of nitrogen, phosphorus and potassium in the mix. For example, a 22-0-15 mixture has 22 percent nitrogen, 0 percent phosphorus, and 15 percent potassium. How can you tell which fertilizer to use? The middle number on the bag should be less 0. When applying fertilizer, a minimum three foot buffer area should always be left around lakes and connecting waterways to ensure fertilizer does not come into direct contact with the water. Also, use slow-release fertilizer. This type releases small amounts of nutrients over time to ensure that all are absorbed properly and utilized by the plants. Liquid fertilizer quickly infiltrates the surface and groundwater supplies as runoff when lawns and gardens are irrigated, or during a rainstorm. Slow release fertilizers generally need be applied only once during a growing season. No reapplication is necessary, especially when you incorporate native vegetation into your landscape.